You remember that Galaxy S II? A phone so good they launched it, well, a whole load of times. But after seeing phablet cousins and LTE variants, the true handset sequel is finally here. The Galaxy S III is moments away from being outed in front of journalists and Sammy's business partners in London, but in advance of the big reveal we were given a few hours to acquaint ourselves with the new star away from the crush of the show floor. And what did we make of it? In short, Samsung's tried to bring its Galaxy S series in line with (and in some ways, further ahead of) what its team-up with Google accomplished. It's added some new quad-core Exynos processing juice, a 4.8-inch, HD Super AMOLED screen and a handful of Galaxy S III-only features in an earnest bid to maintain its place at the top of the Android pile. You'll find our detailed impressions and a hands-on video just after the break. The phone retains the physical home button, though it's now slimmer and generally less visually obvious. It's flanked by a pair of capacitive buttons that light up and disappear, and as expected there's the camera module, flash and loudspeaker at the back. The 8-megapixel camera looks to be very similar to what we've seen on both the Galaxy S II and Galaxy Note -- which means it's a pretty capable shooter, although we're withholding judgment until we can test it out it in a mix of scenarios. Instead of shaking up the camera hardware, Samsung's pushed forward with the software interface -- something we've gone into more detail here. In brief, the new camera app supports dual still and video capture, adds face tagging for existing contacts and boasts improved face identification and tracking. The screen is a 4.8-inch HD Super AMOLED display. The bad news? The lack of a "Plus" in that name means it's PenTile, which means that pixelation is still visible despite the 306 ppi density, due to the sharing of sub-pixels. The good news is that the resolution is still really good, and should suffice for all but the most eagle-eyed -- although if you're still not sure you can check out our own microscopic comparisons right here. It's also nice to see that the panel is cocooned in Gorilla Glass 2, besting its relative's fortified face, and it also offered great viewing angles. 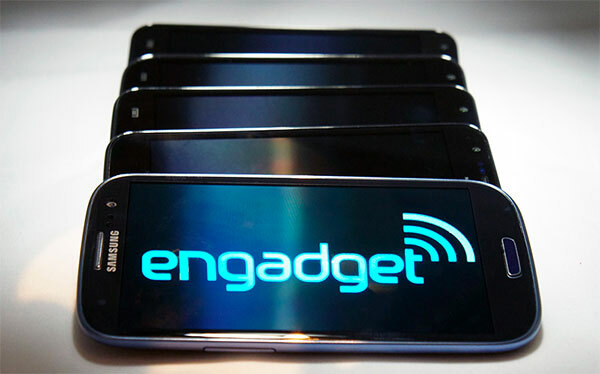 The Galaxy S III's beating heart is Samsung's new 1.4GHz quad-core Exynos processor, aided by a fresh GPU that is supposedly 65 percent faster than the companion Mali 400 graphics chip on the Galaxy S II. Unfortunately, we didn't have time to give GTA III a blast, nor run our typical benchmark apps, but in any case the model we played with was not final hardware. That said, we were able to grab a quick SunSpider browser performance score of just under 1,500ms, putting the phone below HTC's white polycarbonate wonder -- but lower is better, by the way. Whizzing around the native apps and web browser was as pleasant as we expected, pinch-to-zoom pinged into action, while multimedia playback was effortless, irrespective of the software additions that Samsung has thrown into the mix (more on those in a second). The phone houses a removable 2,100mAh battery, with a wireless charging option already in the works. Next to the battery and space for a micro-SIM, you'll find an increasingly rare microSD slot, whose absence was one of the main criticisms leveled at the Galaxy Nexus, not to mention the HTC One X. This expandability sits alongside 16GB, 32GB or 64GB of internal storage, depending on which variant you buy. Other connection options here include Bluetooth 4.0, WiFi Direct, DLNA, an MHL-compatible micro-USB port and headphone socket, with NFC connected to the battery unit. Samsung's pitch to us focused heavily on the software. Pure Android enthusiasts may wince at the sight of TouchWiz (overlaid on top of Android 4.0.4) and from the brief time we played with the device, Ice Cream Sandwich looks a lot like how it arrived on our updated Galaxy S II -- it's not close to a stock Android experience. Instead of messing with its UI, Samsung has concentrated on specific apps -- and plenty of new gesture functionality. Five icons populate the base of the screen, including the app drawer, while the homescreen itself has a more typical four-icon-wide berth. 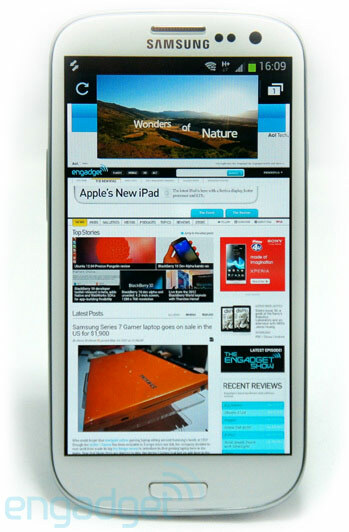 "Inspired by nature, designed for humans" is the winsome philosophy behind the Galaxy S III. In terms of the nature thing, this basically means that the phone comes loaded with some splashy water graphics and sound effects as well as plenty of seasonal wallpapers (including some new smart wallpapers like a background news feed). The built-in keyboard is perfectly functional; at this screen size there's simply a greater likelihood of hitting the letter you're after. The menus and icons are all drawn in Samsung's TouchWiz style, though there are some new additions, including lock screen app shortcuts. In fact, the lock screen is where Samsung's new "intelligent" smartphone starts showing its gesture antics -- part of its "designed for humans" mantra. Once enabled in settings, you can tap and hold the screen, rotate the phone horizontally and you'll be sent to the camera app. Using the same accelerometers, a new calling function will dial whoever's contact details you have displayed when you raise the phone to your ear. Keeping with the contextual phone skills, Samsung's Smart Stay feature makes the device detect (through the front-facing camera) whether a face is looking at it in order to switch the display on or off. A little eye icon would appear on the notification bar when it was seeking out our face. Similarly, Smart Alert will display any missed calls or notifications when you pick up the phone, using the built-in accelerometer. It's the sort of magic that HTC's been using for a while, but it does help the new phone to stand out from Samsung's existing phones that are starting to blur together. S Voice is Samsung's latest effort to introduce voice interactions to its phone series, but unfortunately it wasn't working during our briefing. We've been promised that your commands will be able to unlock the phone, control the music player and capture photos. Samsung also told us that it's already working with third-party apps to build up similar functionality for those too. Like a certain voice assistant rival, it does require a data connection because voice patterns are processed in the cloud. S Beam was in a more generous mood during our hands-on, riffing from Google's Android Beam while using WiFi in tandem with NFC to share meatier files. Beaming through NFC peaks at around 400Kbps, but that's only for pairing and smaller files -- sharing media engages WiFi Direct at up to 300Mbps, according to Samsung. We saw a 10MB video file bounced between two phones in an instant. It's a very nice show-piece, although the necessity for all your S Beam sharing partners to upgrade to the Galaxy S III does inevitably taint that offering. AllShare Play shares your media content with the big screen, while AllShare Cast will duplicate your phone's display for big-screen gaming. (Samsung told us that it's working on populating its own game hub with optimized titles, although it was still keeping quiet on any specifics.) Like S Beam, this is also broadcast through WiFi Direct to a compatible TV, rather than through DLNA -- although the handset does technically still support DLNA. A new feature that best showcases the phone's new Exynos muscle is Pop Up Play, which plays a video file on top of any other app in its own window. Playback is limited to the native media player -- no YouTube greatest hits on top of your email just yet -- but the window can be moved around the screen and at its fixed size covers just under a sixth of the full screen. To recap: this is a good-looking phone, with an impressive high definition Super AMOLED screen and a processor that looks likely to spar for top spot among Android devices. However, Samsung hasn't responded to the recent trend for stand-out build and materials and this new flagship feels a lot like all its older relatives; given the whole "nature" spiel, some smart new finish would have been nice. It's no doubt this lack of wow-factor hardware that has led Sammy to emphasize software progress instead, and indeed there are plenty of intriguing TouchWiz features that warrant further investigation on a finished handset -- assuming you're not a vanilla Android die-hard. Glacial hardware design progress aside, if Samsung manages to get these new features polished up and working flawlessly, the company might well have another bestseller. And yes, we'll take the Pebble Blue, please.